Our Farm Bucks Program is on hold for 2018, but you can read more about how it works here. You purchase Farm Bucks in the spring, which gives you a credit at our Farm Stand. Visit the farm Saturday mornings, June 17 - Oct 7 to spend your Bucks. Receive 10% increased value if you purchase your card before April 30. Receive 5% increased value if you purchase your card before June 15. 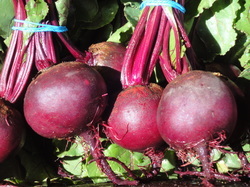 You'll get a weekly produce availability e-mail update. If you run out of Farm Bucks at the end of the season, you can always use cash or checks​. If you don't use up your Farm Bucks by the end of the summer you can carry your balance to next year, but it must be used that second season. We will have a great selection of vegetables (see full list below), as well as u-pick strawberries and flower bouquets. You can also use Farm Bucks for special orders of storage crops (like winter squash) or bulk crops for food preservation (like basil for pesto). Wallet-free shopping! We'll keep a weekly record of your Farm Bucks balance at the farm stand. Know what's coming up for harvest each week through a Thursday e-mail update, complete with recipe ideas. Get the produce you want, when you want it. Great for folks who have a garden of their own, or who are out of town for part of the summer. Feel good knowing you are sustaining local, family farming in Quincy! Make it a family tradition! The farm is a beautiful place to hang out with your friends and family. Bring a brunch picnic and make an event out of it! Up-front purchases help the farm with much needed spring cash flow to hire employees and purchase seeds, tools and amendments. Knowing how many Farm Bucks we've sold will help us minimize waste by accurately planning crops for farm stand sales. We want this farm stand to be a wonderful fixture of quality mountain life in Quincy! Knowing that we have a dedicated customer base helps us keep it going! Sign Up for Farm Bucks! Here are the tasty and fresh crops we have planned for the 2017 season. Some will be available all season long, and some have a shorter 2 to 4 week harvest season. We'll keep you updated about upcoming harvests through a weekly e-mail, including recipe ideas. Hot Crops: We're going to give some hot crops like tomatoes and eggplants a try in our hoop houses this year, specially for the Farm Stand!